On the Today Show, we talked about a mindset shift that makes life easier for working parents. Does 50/50 mean you split tasks evenly every day? No. Sometimes it’s 60/40 or 90/10. What we’re talking about is a core belief: That dads need the time with their kids just like women do and that moms need their jobs just like men do. As more of us -- and our employers -- think this way, we’ll all have more of what we want in life. 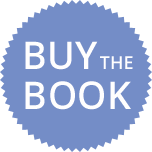 We are making a special offer of a free signed copy to the first 20 book clubs that select Getting to 50/50 for their groups and will be available via Skype to talk with your club about the book. Attached are our book discussion outline, FAQs and 50/50 Facts. More information, press and praise for Getting to 50/50 below. After interviewing hundreds of parents and employers, surveying more than a thousand working mothers, and combing through the latest government and social science research, the authors have discovered that kids, husbands, and wives all reap huge benefits when couples commit to share equally as breadwinners and caregivers. Mothers work without guilt, fathers bond with their kids, and children blossom with the attention of two involved parents. The starting point? 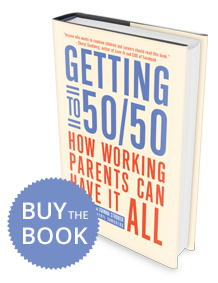 An attitude shift that puts you on the road to 50/50 —plus the positive step-by-step advice in this book. Here are real-world solutions for parents who want to get ahead in their careers and still get to their children’s soccer games; strategies for working mothers facing gender bias in the workplace; advice to fathers new to the homefront; and tips for finding 50/50 solutions to deal with issues of money, time, and much more. Sharon Meers is a former managing director at Goldman Sachs. Joanna Strober is managing director of a private equity firm in Silicon Valley. They live with their families in the Bay Area and speak frequently on work-life balance at companies, universities and professional organizations nationwide. USA Today, New Roles at Home call for New Rules.